How Much Do You Actually Know About Human Rights? On the 10th of December, we celebrate the International Human Rights Day. For this ocasion, the No Hate Speech Movement has prepared this little quizz, to test you on your Human Rights knowledge. Will you pass the test? What is the accepted International definition of hate speech? There is no universally accepted definition of the expression “hate speech”. The Council of Europe definition. The European Court of Human Rights case-law has established certain parameters making it possible to characterise “hate speech” in order to exclude it from the protection afforded to freedom of expression or freedom of assembly and association in Europe. Is freedom of expression an absolute protected right in Europe? In some cases where expression or speech is deemed to be “hate speech” within paramaters set down by the European Court of Human Rights then the protections afforded to freedom of expression can be lifted. A group of young leftist agitators trained using taxpayer money to eliminate the expression of dissident political opinions online. It's a youth campaign of the Council of Europe for human rights online. This campaign seeks to reduce the levels of acceptance of hate speech and to develop online youth participation and citizenship including in internet governance processes. What is the situation on International Human Rights treaties? All States have ratified all of the human rights treaties. All States have ratified at least one. There aren’t human rights treaties. They don’t exist. ...and 80% of States have ratified four or more, of the core human rights treaties! How many articles has the Universal Declaration of Human Rights? It depends on the country, but usually it has around 30. The Universal Declaration of Human Rights has 30 articles! 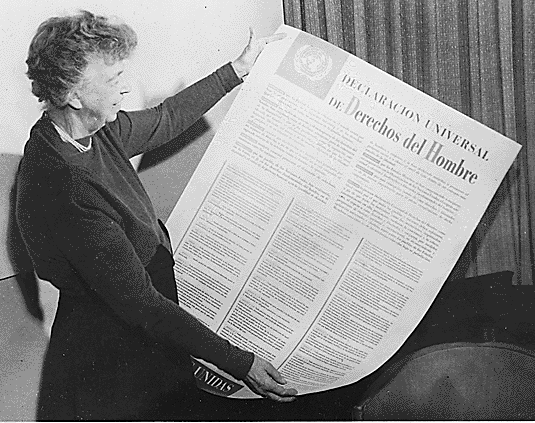 What date and where was the Universal Declaration of Human Rights adopted? The Universal Declaration of Human Rights was adopted in the city of lights! The United Nations (UN) defines discrimination as behaviour that includes any distinction, exclusion, restriction or preference based on what?